OperaTor is a combination of Opera, the anonymization network Tor and Privoxy, similar to Foxtor which offers the same functionality for Firefox. I don't want to bore you with a lengthy technical description of how Tor is providing anonymity, just that much: Tor uses a layered approach sending your request through a series of servers that only know the server before and after them in the connection chain. This means that the destination server does not know that you requested the package, it only knows the IP of the server before that made the request. OperaTor is not complicated to setup and use. You only need to download the binary executable for Microsoft Windows and unpack it on your system. No installation is required which is great for mobile use. You can copy Operator to your USB stick and run it from any computer that has Internet access. Great for internet cafes and other public computers. Just start the OperaTor.exe and all three required applications will be started automatically. Just use Opera as usual from this point on and rest assured that no data will be saved on the local computer. It is a good idea to test the connection and make sure that you are really surfing anonymous. The easiest way would be to check that with a script that displays your IP. I have published a basic script that displays your IP. Compare that IP to the one when you are not using OperaTor to know that the service is working. The developers are updating OperaTor whenever a new version of Tor, Privoxy or Opera come out. Make sure you check the site frequently to always use the latest version of OperaTor. Update: Operator has been discontinued. The developer has created a new program, called Operator YAPO. Please note that the program has not been updated since its initial release. This means that an old version of Opera is used which you should not really be using anymore. 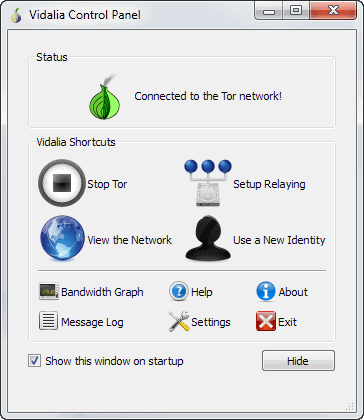 Your best bet at this point in time is to download TOR from the official website over at the Tor Project. Here you can download the Tor Browser Bundle or the Expert Bundle. The former ships with a web browser so that you can use it out of the box without any sort of configuration, the latter requires that you configure TOR on your system so that applications can use the application when they connect to the Internet. If you use the expert bundle, read the manual first as you need to understand how to configure Tor this way (via parameters) before you start it up. The third option that you have, which you may like the most, is to download the Vidalia Exit Bundle. This includes Tor and a configuration tool that you can make use of to change how the program works. The tool is displayed with a user interface so that you can click your way around to use it. Does OperaTor ‘work’ for Opera’s inbuilt bittorrent? ie – are your bittorrent downloads and uploads ‘safe’ – and how much does it slow it down? operaTor is incredibily hussle-free, and works flawlessly as compared to FoxTor, Torpark and other apps. When things inevitably get slooow…can future updates include a flush tor network capability? Colin: it probably does but it is considered bad etiquette to download large amounts of data via tor, remember that tor relays (the computers that the data is routed through) are run by users like you and most of them have a limited amount of bandwidth available so if on person downloads 700MB or so they may reach the limit allowed (they can set how much bandwidth they wish to give to tor per day or per week, month, etc…) then that relay may be out of action for the rest of the month so it could be unavailable for other users. In addition to this it slows things waaaay down for other users if you are downloading lots of data. Bottom line is if you want to download text files or similar it would be acceptable, but no software or movies unless its VERY small. mermie: the whole tor network is essentially a sequence of proxies, but with a much better level of privacy.